Farmers must be a lot smarter than we tend to give them credit for being. 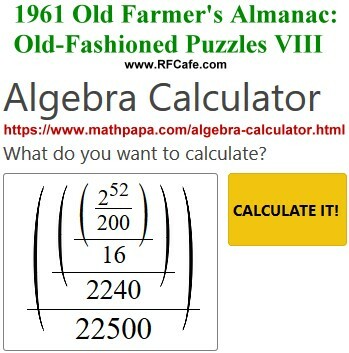 These math and logic puzzles that appeared in the 1961 Old Farmer's Almanac are not a duffer's task to complete. Be careful to consider units of measure based on the venues (farming, shipping, etc.). Puzzle I is a relatively simple trigonometry problem, although the wording of the problem statement is very confusing; it took some head scratching to figure out what was meant. 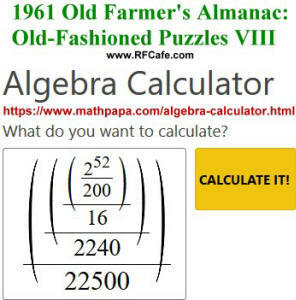 My answer is off from theirs - probably due to working it out with an electronic calculator rather than an slide rule (i.e., rounding errors). Puzzle II is somewhat shocking in its constitution, but considering the era, not so surprising. Puzzle III required me to opt for a graphical solution since I could not come up with enough independent equations for the number of unknowns. If you look at the OFA page scan, you will see typesetter's errors that add to the difficulty. The provided solution is no help either, at least for me. Puzzle IV seems utterly nonsensical, but it is actually legitimate); in fact, I was convinced it was also a typesetter's error until I looked at the answer and figured out what was expected. Maybe those types of challenges were common in 1961 and didn't need to be explained to farmers. Problem V was solved graphically rather than doing the hard geometry. After setting Visio's page scale to display the proper line dimensions, I created three lines of the specified lengths with 120° between them at the vertex, then drew an equilateral triangle that intersected them all at the sides. 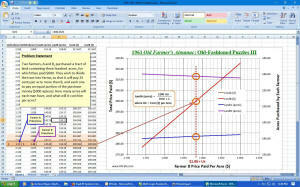 Visio provided the triangle side length measurements, so I needed only to calculate the area of the resulting triangle. My answer, however, is half of the given answer, but I suspect the OFA answer is wrong. 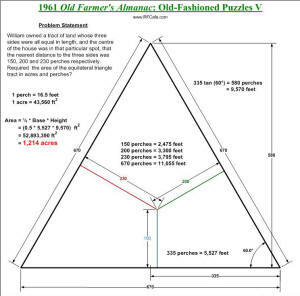 It appears they multiplied the full length of the equilateral triangle base by the height rather than half the base times the height. I'll be glad to be proven wrong. Number VI was easy enough after being certain to use exactly the information provided in the problem statement (still, it was somewhat ambiguous). Puzzle VIII was a lead pipe cinch. 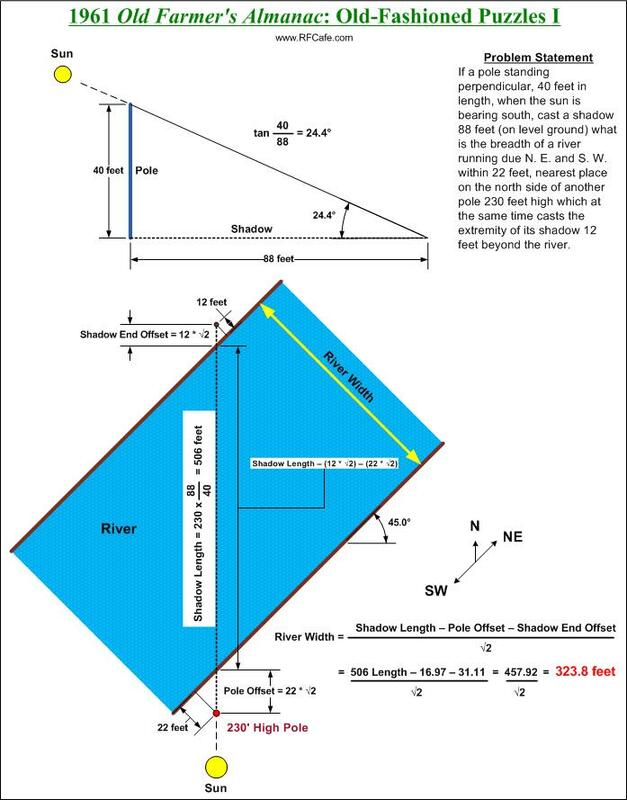 If a pole standing perpendicular, 40 feet in length, when the sun is bearing south, cast a shadow 88 feet (on level ground) what is the breadth of a river running due N. E. and S. W. within 22 feet, nearest place on the north side of another pole 230 feet high which at the same time casts the extremity of its shadow 12 feet beyond the river. There is a story that a ship's crew of 30, half whites and half blacks, were short of provisions, and it became necessary that half of them should be thrown overboard. It was agreed that they should be placed in a ring on deck, by the captain, and that as he counted round and round, every tenth man should be thrown over, until the crew should be reduced one half. He so placed them that all the blacks were taken. What was the order of arrangement ? Can you so place them? 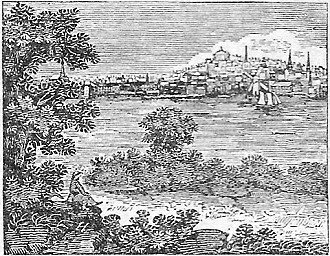 Two farmers, A and B, purchased a tract of land containing three hundred acres, for which they paid $600. 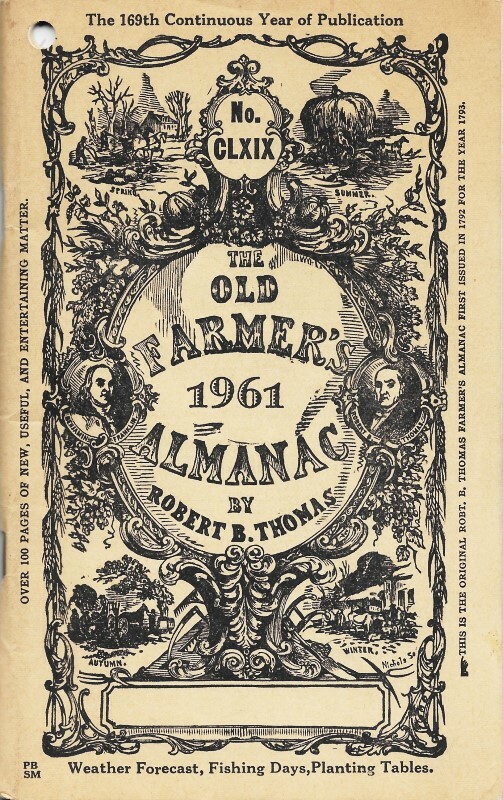 They wish to divide the tract into farms, so that A will pay 25 cents per acre more than B, and each one to pay an equal portion of the purchase money ($300 apiece). 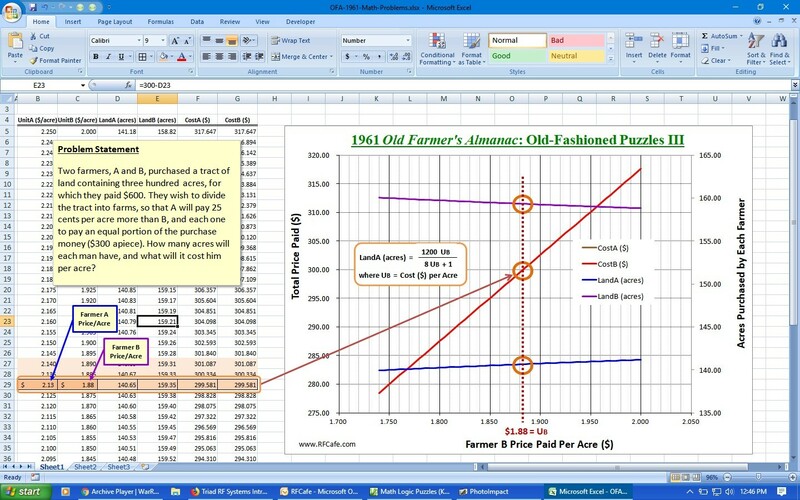 How many acres will each man have, and what will it cost him per acre? 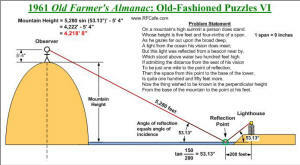 William owned a tract of land whose three sides were all equal in length, and the centre of the house was in that particular spot, that the nearest distance to the three sides was 150, 200 and 230 perches respectively. Required ­ the area of the equilateral triangle tract in acres and perches? On a mountain's high summit a person does stand. Whose height is five feet and four-ninths of a span. Which stood above water two hundred feet high. Is quite one hundred and fifty feet more. From the base of the mountain to the point at his feet. There is a house 66 feet long by 72 wide, and from the bottom or foundation of the building to the peak is 43 feet. 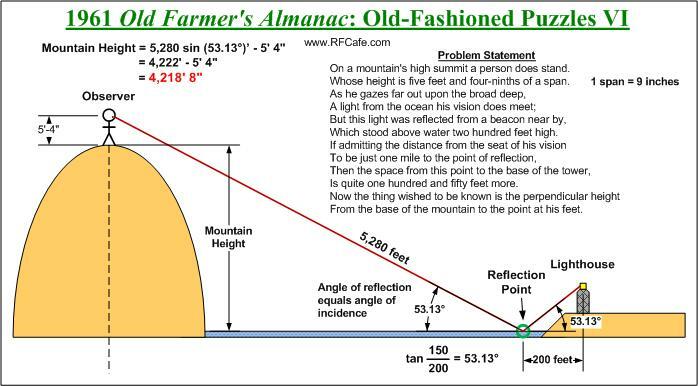 Required the distance from either lower corner of the house to the centre of the peak or ridge-pole? 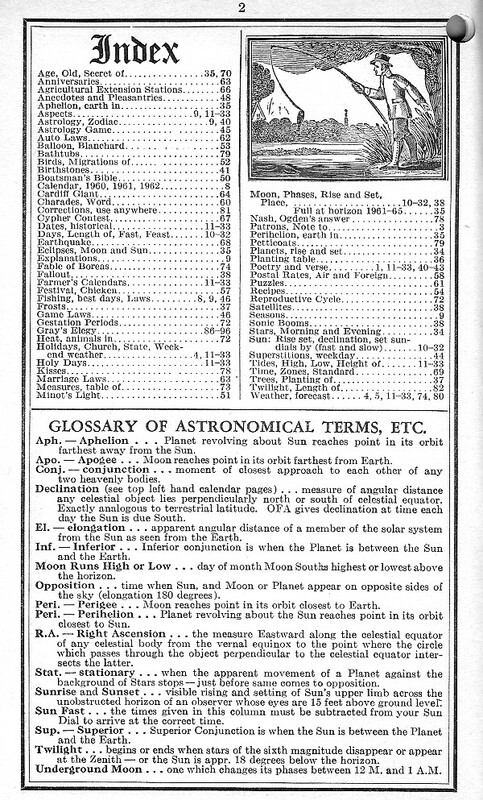 If one pin was dropped into the hold of the "Great Eastern" the first week, two pins the second, four the third, and so on, doubled each week for a year, (52 weeks) how many pins would there be, what would be the weight of them, allowing 200 pins to the ounce, and how many "Great Easterns" would be required to carry them, her tonnage being 22,500 tons? In this case, a picture is needed to explain the Puzzle I solution to this problem because writing it out would take 1,000 words (or more). I. Breadth of River, 327.464 feet. Note: There was a comma in the decimal point place on the printed page - which is OK for EU and Canadian folks, but confusing to Americans - so I changed it here). My solution: See graphic to the right. My solution: I didn't work this one. The given method for a solution to problem #3 is a bit fuzzy, so I plotted a graphical solution based on writing the equation shown from the information provided in the problem statement. III. $2.13,† A's farm per acre. $1.88†† B's farm per acre. Rule. - Square the average price of one acre. Square the difference of price between two acres. Add the two squares together. Extract the square root of the sum. Add the average price of one acre to the result, and you will have the real price of two acres. Please to demonstrate the rule. (one of A's and one of B's). †† B's farm per acre. IV. Mr. Underwood being at the point (.) 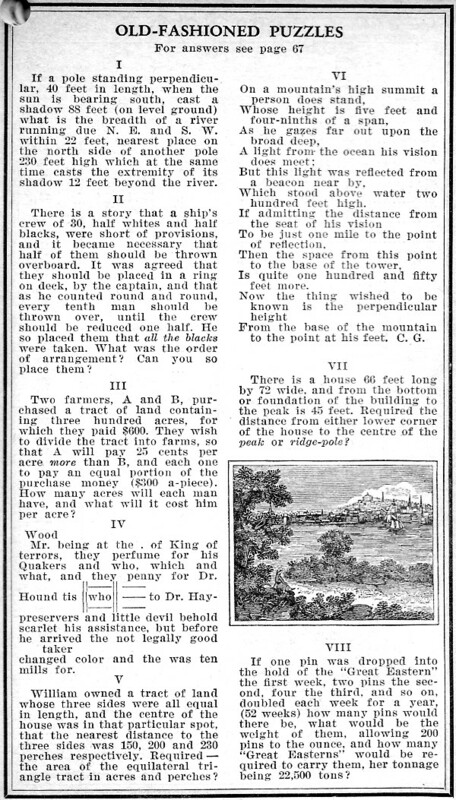 of death (King of terrors) they sent (perfume) for his friends (Quakers) and relatives (who, which and what) and they sent (penny) for Dr. Curtis (Hound-tis) who (inclosed) a few lines (= =) to Dr. Barnes (hay preservers) and imp-lo-red (little devil, behold, scarlet) his assistance, but before he arrived the invalid (not legally good) died (changed color) and the (under)taker was cent (ten mills) for. My solution: See graphic to the right and below. Note: My answer is half of the given answer, but I suspect the OFA answer is wrong. 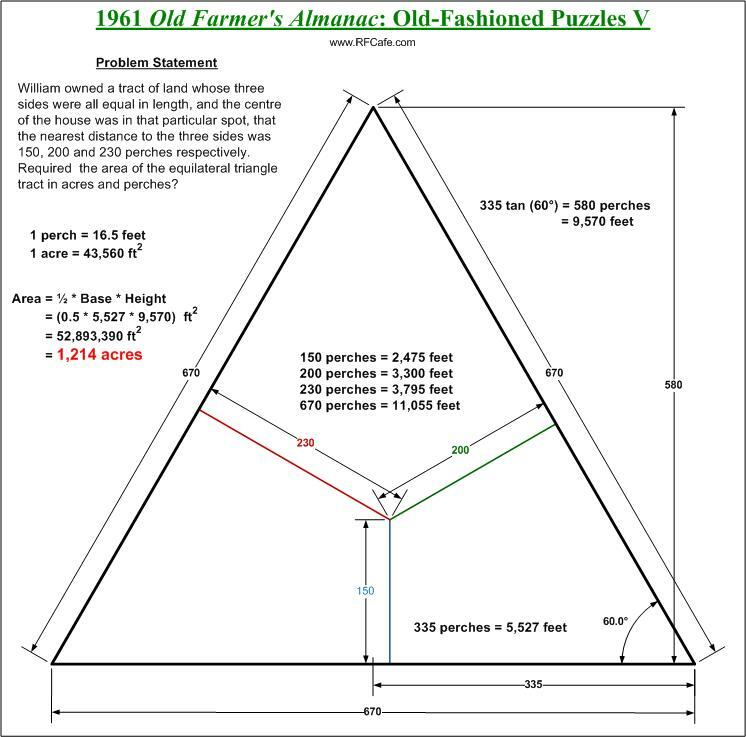 It appears they multiplied the full length of the equilateral triangle base by the height rather than half the base times the height. VI. 4,218 ft., 8 inches. VIII. To Curious Question - Number of pins, 4,503,599,627,370,495; weight, 628,292,358 tons; number of "Great Easterns" required to carry them, 27,924; she carries one ton of pins to every ton measurement.